So, this is one I knew very little about before it appeared in my inbox, but I was interested in it from the get-go. I've always had a love for the Metroidvania style of game. Ever since playing Super Metroid for the first time, I've had a soft spot for the particular gameplay hook of re-exploring previous areas with new skills, allowing you to open up even more areas, and discover even more skills. Eventually though, across multiple playthroughs, you get to know every route, you remember every shortcut, and have every item location memorized. That great feeling of exploration, of discovering secrets, is lessened, and eventually lost completely, because you know exactly where everything is. Wouldn't it be nice if it was different each time? If every time you played, you had a new layout to explore? The people over at Bit Kid, Inc certainly thought so and decided to work a procedurally generated layout into the design of its newest release, meaning that although you'll unlock upgrades, discover areas and meet bosses all in the same order, their actual locations, the location of objects and secrets, and the routes to get there, are different everytime you play. Now the random element in this is NOT like the random element in something like say, Dead Cells, Enter the Gungeon or Vertical Drop Heroes. The world doesn't "reset" when you die like you see in many rogue-likes, instead, the random element is all about replayability AFTER that initial completion. Every new playthrough will be different, but, to make this worthwhile, you initially need to make a game good enough that you want to replay it more than once. That's what Chasm is attempting to do, but does it succeed? Well kinda, but let's get the story out of the way first. You play as a young knight-in-training, and the opening scene begins with you being summoned to the office of your captain. An urgent message has been received from a nearby mining town. While digging for resources, they discovered something strange and ancient, buried deep underground. From this mysterious location have emerged a horde of monsters, who then proceeded to terrorise the town and now infest the mine, shutting down all production. The townsfolk need help, but with all the knights out on assignment, the captain has decided to send you, his star trainee, to aid them instead. So, you quickly grab a basic sword from the armoury and rush off to complete this task, excited to be doing a "real" assignment. Arrival at the town, however, leads to the discovery that things are worse than first reported. The monsters attacked in the night and the village is now almost deserted, the creatures having captured and imprisoned everyone but the town mayor, who survived only by completely sealing the entrance. He pleads with you to head into the mine, free the town's folk, and deal with the monsters before all is lost. Being a young and confident hero, you obviously accept, take the key to unseal the entrance and head off towards the mine. And that's where the game really begins. You'll start with basic weapons and armour as you search along the various corridors and branching rooms, searching for anything of interest. The levels are set out in the usual Metroidvania fashion, dead ends usually have a treasure of some sort, with other routes being blocked by some sort of obstacle. Ultimately you'll only have one real path to go but, and as you advance, you'll pick up some more useful artifacts. These upgrades to your abilities are simple ones, like a climbing glove enabling a ledge grab, shin guards allowing a slide, which can be used to get through narrow gaps, or a lantern to light up dark rooms. These encourage backtracking to explore areas you initially couldn't reach and find new rooms and new routes. Doing so will reveal chests filled with newer, stronger weapons, better armour, different items and sometimes things for villager sidequests. They also allow you to find more of the imprisoned townsfolk, each of whom will, when freed, provide a service back in town. One will sell potions, another will sell food, or weapons or a variety of other goodies, all of which will allow you to, hopefully, progress a little further, advancing through the locations, hoping to discover a boss and advance to the next biome. There are some minor puzzles along the way, including a simple but interesting one involving a lock and a fresco, but most of the challenge comes from platforming and combat. And you'll do loads of both. The rooms have hazards, enemies and platforms scattered throughout but do start to feel repetitive rather quickly, with the layout mostly consisting of a few repeating, and bland designs stitched together randomly. I quickly began to see areas I already recognised, or were really similar, especially the long straights between room clusters. As you'll be backtracking through these areas a lot anyway, the fact they feel so repetitive is really to the detriment of the game. Fighting is another of the areas where Chasm lets itself down. The combat isn't bad, in fact it can be enjoyable at times, but it also feels frustrating at the same time. The character has a slightly-too-long feeling animation, and you can't cancel out of it when you swing, this led to me getting clipped by enemies a lot before learning to do a little jump attack when fighting, allowing a quicker hit. Different weapons do have different attack speeds and animations, and some are better than others, but all had an attack animation that can't be cancelled once started. 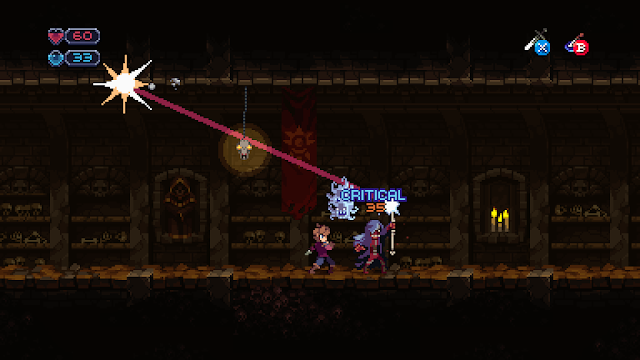 The dodge also has strange timing and also doesn't cancel out of attacks, making it WAY less effective. I found it almost useless in combat, swinging your weapon holds you in place for a second, making dodging almost impossible even though the enemy attacks are, for the most part, well telegraphed. And this is where the game shines a little brighter. There are a diverse bunch of creatures in Chasm and all are reasonably well designed and fit with their environment. There were a few reskins but, on the whole, I found the designs to be interesting, with a decent range of movesets and behaviours. Learning to dodge them, and trying to work out when you can hit them safely, is fun for the most part, but never amazing. The bosses, in particular, are a good example of this, although they have well designed, large sprites, with good moves and reasonably good patterns, the inability to cancel out of the attack animation, and the crappy dodge, make the battles feel less than stellar. 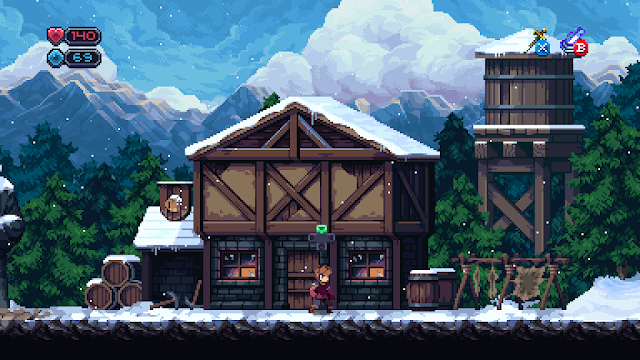 Which is probably my biggest take away from Chasm. It's okay. Fun, but never amazing, and considering they based the games hook on its replayability, you'll probably not bother to do more than one playthrough. 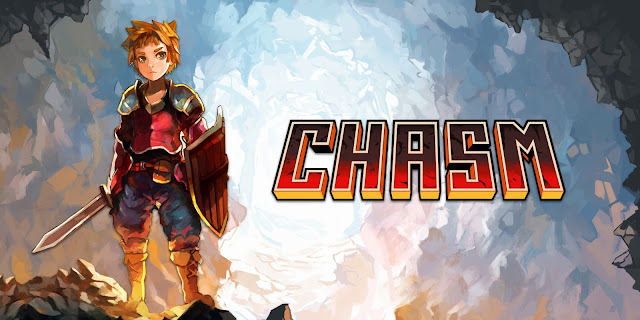 Simply put, there are SOOOO many amazing Metroidvania games out there, we are going through a golden age of them, and new titles must either do something special, or do the simple stuff EXCEPTIONALLY well if they wish to succeed, and unfortunately, Chasm is firmly in the "meh" category on both accounts. Fine, but not one of the greats. Wanted this to be better but the combat and movement really let it down. Maybe it's coming off of playing Dead Cells where the combat is really satisfying but Chasm was a mediocre experience. Both the "meh" combat and bland level design make it less than perfect. Pity cause I really wanted to like it from the artstyle and description. Great work man, sounds like a fair review. Thanks mate! I enjoyed the game but it's distinctly average. Shame because the basic idea is sound, even if the execution let's it down.